Remarks Son ([sA=f n Xt=f] his son of his body) of Raramu (owner of G 2099). 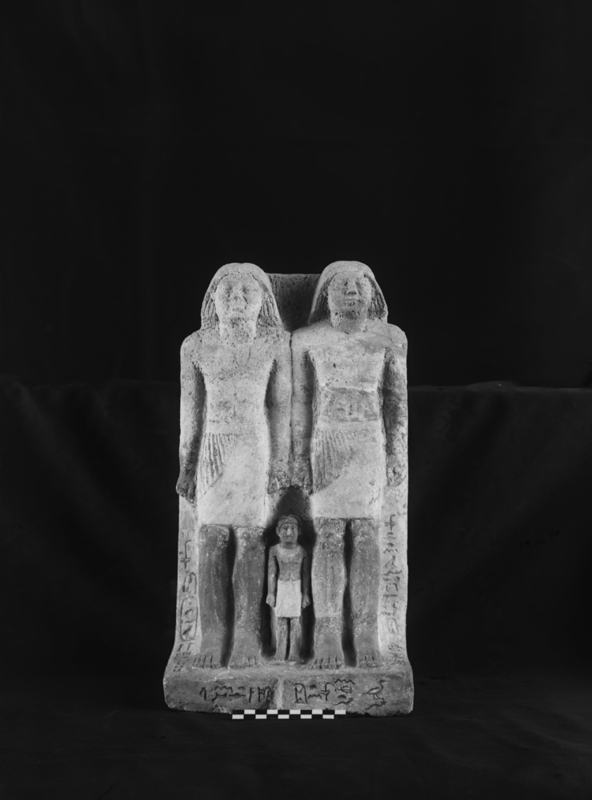 Limestone triad (39-1-18 = Cairo JE 72138) of two men and small boy, Raramu (proper left), Nikauptah (proper right), Kednes (boy, center); Kednes identified as [wab nswt sS] royal wab-priest, scribe; limestone standing statue (39-1-19 = MFA 39.831 deaccessioned = Richmond 49.21) inscribed for Kahersetef, back pillar recut for Kednes, identified as [wab nswt Hm-nTr xwfw] royal wab-priest, priest of Khufu; both statues found in situ in G 2099 serdab. Remarks Limestone triad (39-1-18 = Cairo JE 72138) of two men and small boy, Raramu (proper left), Nikauptah (proper right), Kednes (boy, center); Nikauptah identified as [wab nswt Hm-nTr xwfw] royal wab-priest, priest of Khufu; found in situ in G 2099 serdab. Roth (Giza Mastabas 6, p. 152) suggests Nikauptah as secondary name for Raramu (owner of G 2099). Remarks Owner of G 2099. Seated statue (39-1-17 = Toledo 49.5) inscribed for Raramu (with his daughter Tjes-tjaset and his son Kahersetef depicted on sides of seat), identified as [wab nswt Hm-nTr xwfw m swt nb rx nswt jmj-xt xntjw-S pr-aA] royal wab-priest, priest of Khufu in all (his) places, royal acquaintance, under-supervisor of palace attendants of the Great House; limestone standing pair statue (39-1-16 = Toledo 49.4) inscribed for Raramu and his wife Ankhet; Raramu identified as [rx nswt wab nswt pr-aA] royal acquaintance, royal wab-priest of the Great House; limestone triad (39-1-18 = Cairo JE 72138) of two men and small boy, Raramu (proper left), Nikauptah (proper right), Kednes (boy, center); Raramu identified as [rx nswt jmj-xt pr-aA wab nswt xntjw-S] royal acquaintance, under-supervisor of palace attendants (royal wab-priest) of the Great House (words of titles seem to have been copied slightly out of sequence); statues found in situ in G 2099 serdab.